When you think about a college town, chances are good the abundance of alcohol springs to mind. But Palo Alto owes its entire existence to the want of a college town without booze. 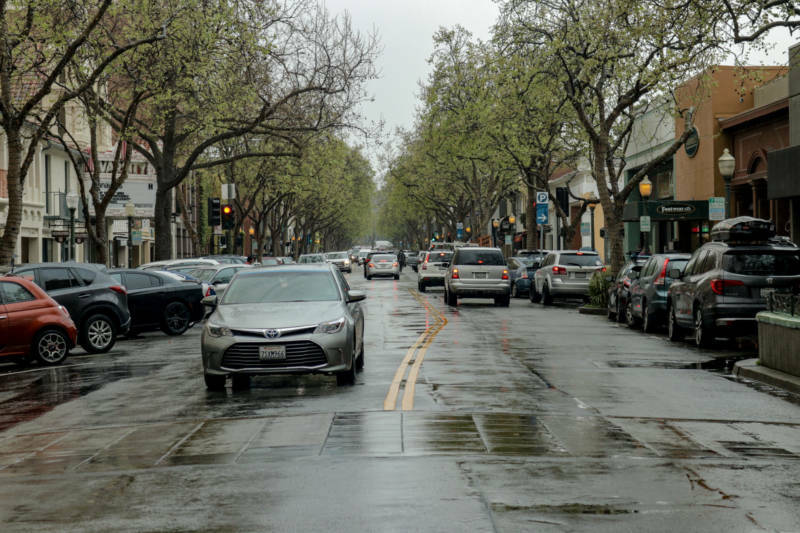 It's also why Palo Alto has two downtown-like districts: the "official" downtown along University Avenue that leads into Stanford University, and California Avenue a few miles to the south. 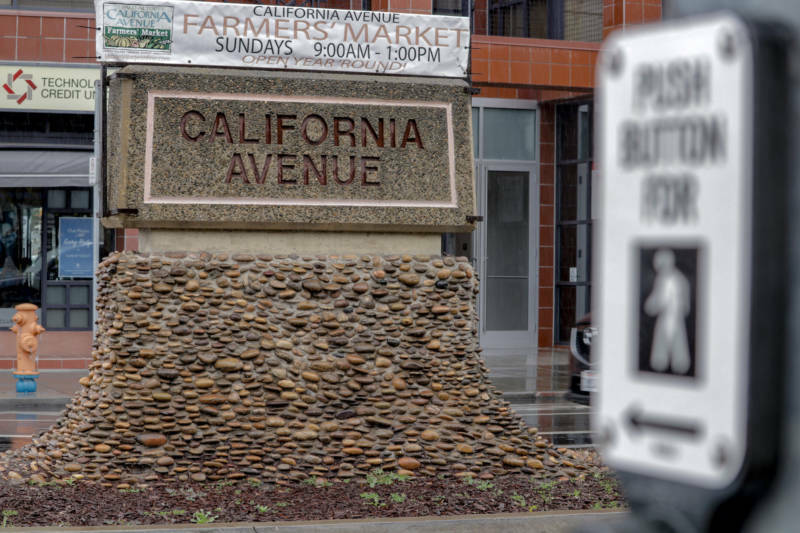 "Palo Alto has two separate downtowns because it was originally two separate towns," said Steve Staiger, the historian for the Palo Alto Historical Association. Before there was Palo Alto, there was Mayfield. Founded in the 1850s, it was one of several small communities interspersed among the rural farmland of the 19th century Peninsula. "There was a small downtown of general stores, blacksmiths, saloons and lumberyards that served the farming community that surrounded it," said Laura Jones, Stanford archaeologist and president of the Stanford Historical Society. 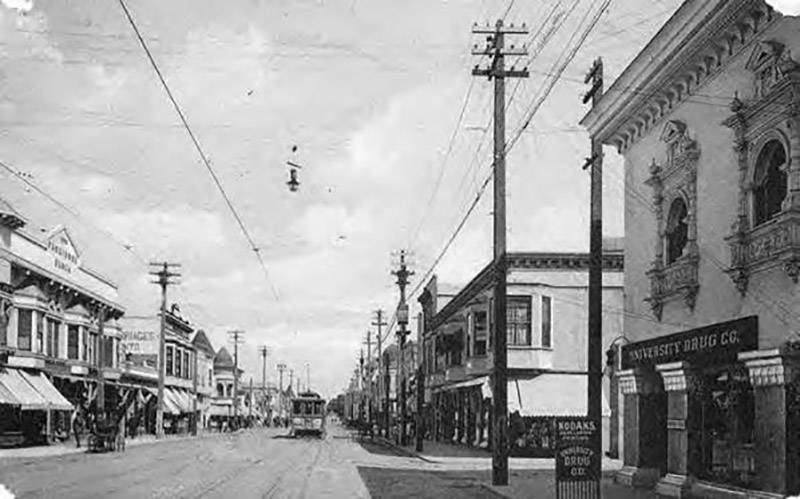 That small downtown was present-day California Avenue, or Lincoln Street as it was then known. 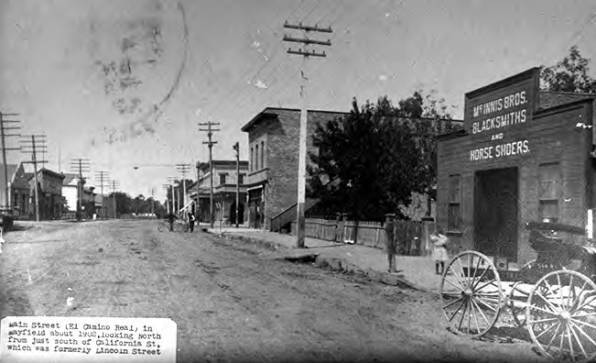 And in 1886, when Leland and Jane Stanford were looking for a college town to support the new university they were building nearby, they turned to Mayfield. There was just one condition: Mayfield would have to go dry, ending the sale of liquor within the community. Going dry was going to be a hard sell in Mayfield, though, because much of the community's economy was built on the back of its 13 saloons and two breweries. "This is a place where the population of predominantly single men would come off the farms or the ranches or the sawmills on Friday, come to town and spend their week's wages drinking," Staiger said. In the end, Mayfield's leaders decided that booze was more profitable than books and rejected the Stanfords' offer. But the couple quickly turned to Plan B. If Mayfield wouldn't become their dry college town, they would create their own. The Stanfords asked Timothy Hopkins, one of Leland Stanford's friends and colleagues in the railroad industry, to buy 700 acres of farmland a few miles north of Mayfield and start selling lots. "If you bought one of the lots from Timothy Hopkins, you were not allowed to sell liquor on it," Jones said. "And if you did the property reverted to Timothy Hopkins. And so they established a dry town, which is now what we think of as Palo Alto." The two towns coexisted for a few decades. Stanford University opened in 1891 with Palo Alto as its dry college town, attracting mostly transplants from the East Coast and Midwest. 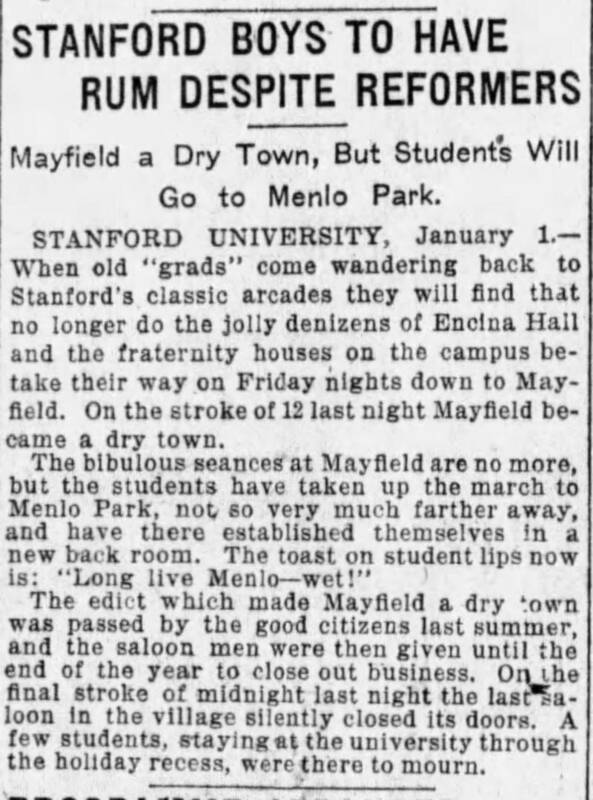 Mayfield, on the other hand, remained a blue-collar town that offered cheaper housing to Stanford students and, of course, a steady supply of alcohol. Mayfield was such a popular destination for Stanford students and faculty that the president of the university reportedly closed the gate on the road leading to Mayfield in hopes of preventing students from making the libatious pilgrimage. But the steady stream of customers from Stanford wasn't enough to keep Mayfield afloat. The farmhands and lumber workers who had kept the saloons filled were increasingly being replaced by young families who were less interested in a community built around alcohol. 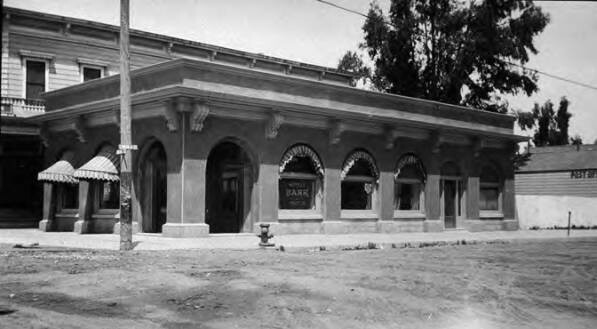 When Mayfield officially incorporated itself as a town at the beginning of the 20th century, one of the first things the new town's elected leaders did was follow Palo Alto's lead and close down its saloons. "They realized their old economic model was no longer viable," Staiger said. But a dry Mayfield turned out to be just a poorer, less impressive version of Palo Alto, which was continuing to grow in size and success. 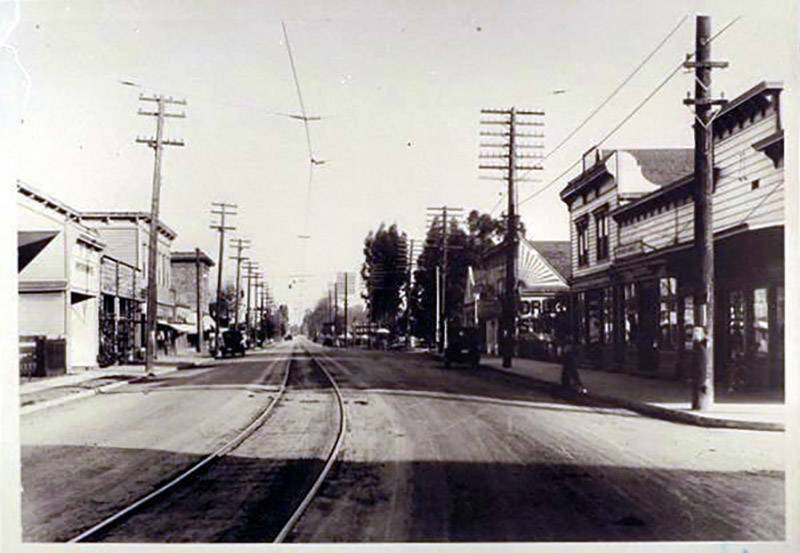 In 1925, the residents of Mayfield voted to merge with Palo Alto, and on July 6 Mayfield officially ceased to exist. 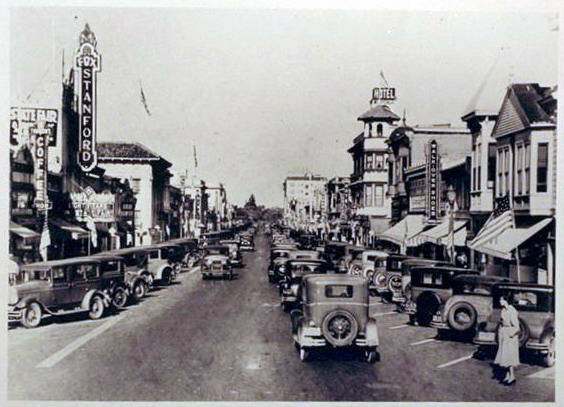 Palo Alto already had a Lincoln Street, so they rechristened Mayfield's downtown as California Avenue. The Palo Alto government did its best to scrub its new addition of the name Mayfield, renaming everything South Palo Alto. But Staiger said that the people who lived in Mayfield never lost their sense of where they were truly from. "There was a woman on our board who grew up in Mayfield for the first five years of her life, and she had lived in the neighborhood ever since," Staiger said. "She was not a Palo Altan in her mind. She was a Mayfieldian."